We’ve been teaching seminars lately on Smartphones. We use our Droid phones to demonstrate all the cool stuff we can do with them. The excitement over Smartphones reminds me of when the Personal Computer first came out. Back in 1983 I started teaching ‘Introduction to Personal Computers.’ People were thrilled with word-processing, spreadsheets, and databases. As, ‘personal’ computers became all about business, they tied us to the office and got kind of boring. Now, nearly 30 years later, computers are getting personal again in the form of Smartphones. They fit in our pocket and work without any kind of cord or cable. They handle all our email, take pictures, and use GPS to tell us how to get to anywhere we want to go. They can scan bar codes at the store and tell us where to find the same product at a better price. They can even translate our English into Spanish, French, or Chinese and speak the results for us. Oh … and they also make phone calls! 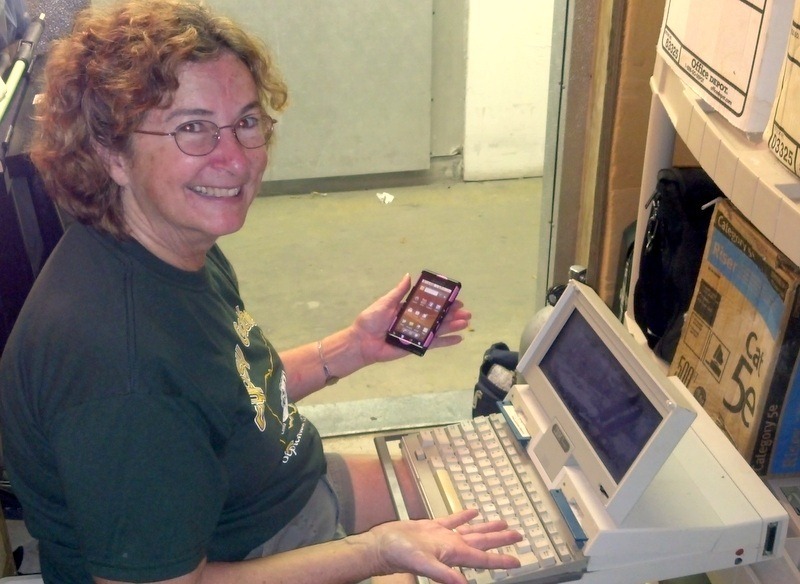 The picture above (taken with Jim’s Droid of course) is of me visiting our storage unit where we keep relics like my very first laptop. It’s an IBM and I used it in the early 90s. No mouse, no hard drive, I used a 1200 baud modem to connect to the Internet. There was no World Wide Web, but there was CompuServe! The Droid smartphone I’m holding in my left hand does SOO much more than the laptop ever did. Things that were never even dreamed of back in 1992! If you’ve been on the fence about getting a Smartphone (Android or iPhone), we encourage you jump in! Even the most computer-averse person I know, quickly fell in love with her smartphone. 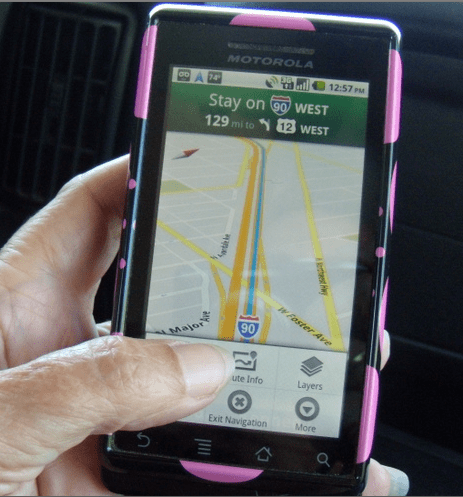 Especially if you don’t have an office, or you do a lot of traveling, you may find the smartphone is the only computer you’ll need. For our members, we have started a series of Tutorial Videos on using the Droid. A free sample video on Email to Navigation is available on our Youtube channel. Better yet, register for our Techno-Geek Learning Rally April 22-28 in Bushnell, Florida and you’ll get lots of lessons, even small group, hands-on lessons with Smartphones. Our co-hosts from TechnoRV use iPhones, and other Apple products too so it won’t just be the Geeks with their Droids. Published by MrsGeek, in Blog. Tagged with 1992 IBM Laptop, Personal Computer, Smartphones. Attended your “Outsmarting Your Smartphone” presentation both on the cruise and at the BRCS meeting. Finally, broke down and got a Droid Samsung Epic 4G smartphone. Your information helped greatly. Still trying to figure everything out though. I use a Verizon Samsung Galaxy Tab 7″ on Wifi when not on the road. Then when traveling, I can add 3G by the month for only $30. for 2GB’s. Smartphones can run Wifi only also. I do have a Smartphone also, running on 3G but I like playing with gadgets. I really love my DROID. However, recently it has really slowed down. My wife’s iPhone opens aps faster the my DROID. We have unscientifically tested speed by starting the same ap and the same time. I’ve thought about updating to new version of operating system DROID has available but do not like the idea of having to find and down load all my special aps. I am considering switching to iPhone because it seems to run faster and aps are synced thru iTunes. Any thoughts that could convince me to stay with DROID? We’ve come a long way baby. Our first pc was a Trash-80 with 16K on an audio cassette. Started teaching DTP and Computer Familization on MAC Plus in mid-80s…. and the software and hardware changes meant job security. We are teaching our Smartphone workshop next Thursday at Nick’ Western GJ Rally. Still tweaking PP and will send you the final copy and handouts. I’d love to have a smartphone, but, so far, I haven’t been able to justify the extra $50+ a month. My first computer was an IBM PCjr. Then I moved to Apple’s first computer, and I’ve been a MAC user since. My husband is a PCer, and we travel in our motor home with his laptop and my iPod Touch and Kindle Fire. There are times when I could have used a smartphone, but, as I said, it’s the extra cost that’s stopping me.